A CRH3C high speed train at the Tianjin Railway Station. The Beijing–Tianjin Intercity Railway (simplified Chinese: 京津城际铁路; traditional Chinese: 京津城際鐵路; pinyin: Jīng-Jīn chéngjì tiělù) is a China passenger-only line high-speed rail that runs 117 km line (72.7 statute miles) between Beijing and Tianjin. The Chinese government built the line to accommodate trains traveling at a maximum speed of 350 km/h (217 mph), and currently carries CRH high-speed trains running speeds up to 330 km/h (205 mph). When the line opened on August 1, 2008, it set the record for the fastest conventional train service in the world by top speed, and reduced travel time between the two largest cities in northern China from 70 to 30 minutes. Viaduct on the Beijing-Tianjin Intercity Railway. From Beijing South Railway Station, the line runs in a southeasterly direction, following the Beijing-Tianjin-Tanggu Expressway to Tianjin. It has three intermediate stations at Yizhuang, Yongle (not yet fully built) and Wuqing. The line currently uses the Jinshan Railway for some extended services to Tanggu. The service has peak speed between cities. The line will eventually be extended further east from Tianjin to the Binhai New Area. As an intercity line, it will provide train service only between the two metropolitan areas, unlike the Beijing-Shanghai High-Speed Railway which will continue beyond Shanghai. The Beijing–Tianjin Intercity Railway has a current length of 116.939 km (fare mileage: 120 km), of which roughly 100 km is built on viaducts and the last 17 kilometres on an embankment. The elevated track ensures level tracks over uneven terrain and eliminates the trains having to slow down to safely navigate through at-grade road crossings. The line opened on August 1, 2008 with 47 daily pairs of intercity trains between Beijing South and Tianjin. Since September 14, 2008, 10 more pairs of trains were added, reducing the minimum interval from 15 minutes to 10 minutes. On September 24, 2008, 4 pairs of trains extended to Tanggu. On September 28, 2008, 2 more pairs of trains were added into service. Frequencies have consistently been increased since to cope with rising demand. These intercity trains are designated by the prefixed "C" (城) followed by four digits, from C2001 to C2298. Of these, C2001–C2198 are non-stop trains from Beijing South to Tianjin. The odd numbers for trains departing from Beijing South and even numbers for those running to Beijing South. Trains numbered C2201–C2268 are trains from Beijing South and Tianjin that stop at on the way at Wuqing and Yizhuang stations. Trains C2271–C2298 run from Beijing South to Tanggu. In addition to the intercity service, 13 pairs of trains were diverted to this line from the preexisting Beijing-Shanghai (Jinghu) Railway, including trains from Beijing South to Jinan, Qingdao, Shanghai, and Tianjin West. With the opening of the Beijing-Shanghai High Speed Railway, these trains have been diverted to the new line. A pair of special track examination trains (numbered DJ01/02) run every day in the morning before any regular trains into service. A track-measuring train (numbered DJ5581/2) runs every ten days. In summary, there are 62 pairs of train in service, 60 of them for passengers. Frequencies are increased over weekends and during major holidays. Following the Wenzhou train crash, maximum speeds were reduced to 300 km/h, with rides taking only three minutes longer than usual. There have been slight drops in fares to accompany the temporary speed limits. Business and VIP Class one-way: ¥115, ¥175 (fare depends on travel route, see below). Special Class one-way: ¥94 (about €10 or $15 US). They are located near the tail of trains, with 8–16 seats per train. First Class one-way: ¥66 (about €7 or $10 US). Second Class one-way: ¥55 (€6, $8 US). Intercity train fares are more expensive than slower trains on preexisting lines. Fares are more expensive for extended trips to Tanggu and cheaper for trips from Beijing South or Tianjin to the midway Wuqing station. Beginning early 2009, frequent rider stored-value cards were introduced for use on this line. Standard Card holders are allowed free seating in the reserved Second Class carriage, Car 6. Gold Card holders are allocated a few reserved seats in Car 5, which is the First Class carriage. There are no discounts for users of these cards, nor does a frequent rider points award program exist. To comply with new ticket ID rules effective June 1, 2011, new and upgraded cards are linked to a document of identity. The line is the first railway in China to be built for operational speeds above 300 km/h. This railway line allows speeds up to 350 km/h. 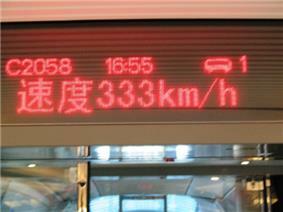 A trip between Beijing and Tianjin takes 30 minutes. With effect from mid-2009, only CRH3 trains are used for intercity services on the line. High speed services to Ji'nan, Qingdao and Shanghai, which used to run on this route, are now diverted to the Beijing-Shanghai High Speed Railway. The signaling system is built around Simis W electronic interlockings, Vicos operations control system and ETCS Level 1 train control system. The catenary system in use is Sicat HA, aluminum cantilever, powered by two sub-stations at 25kV 50 Hz AC. On June 24, 2008 a Chinese conventional-wheeled train speed record was set on the line when a Siemens Velaro-derived China Railways CRH3 train reached 394.3 km/h. Construction of the Beijing-Tianjin Intercity High-Speed Rail Line began on July 4, 2005. In April 2006, Siemens and its consortium partners EEB (Electrification Engineering Bureau) and CRSC (China National Railway Signal & Communication Corporation) were awarded a contract by the Chinese Ministry of Railways (MoR) to supply and install the signaling systems, communications equipment and power supplies as well as the overhead line and to take over responsibility for system integration and overall project management. On May 11, 2007 the first interlocking container for the Beijing-Tianjin line left the Siemens factory in Brunswick, Germany. (This container had been the 1,000th container shipped from the factory overall). Before the line was finished, it was expected that the railway line would handle 32 million passengers in 2008 and 54 million passengers in 2015. The line opened on August 1, 2008 just before the opening of the 2008 Beijing Olympics, which held some football matches in Tianjin. The introduction of high speed rail service significantly boosted rail travel between the two cities. In 2007, conventional train service between Beijing and Tianjin delivered 8.3 million rides. In the first year of high-speed rail service, from August 2008 to July 2009, total rail passenger volume between Beijing and Tianjin reached 18.7 million, of which 15.85 million rode the Intercity trains. Meanwhile, during the same period, ridership on intercity buses fell by 36.8%. As of September 2010, daily ridership averaged 69,000 or an annual rate of 25.2 million. The line has a capacity of delivering 100 million rides annually and initial estimated repayment period of 16 years. From 2008 to 2013, ridership grew at an annual rate of 20% reaching a cumulative 88 million passengers. At the start of construction, an expected ¥12.3 billion (US$1.48 billion) was expected to be invested into the Beijing–Tianjin Intercity Railway. At the time of construction, the Ministry of Railways and the Tianjian government had each contributed ¥2.6 billion (US$325 million) to the project, while the central government requisitioned land and paid for the resettlement of those affected. However, it would later cost $2.34 billion to build. As of 2010, the line cost ¥1.8 billion per annum to operate, including ¥0.6 billion in interest payments on its ¥10 billion of loan obligations. The terms of the loans range from 5–10 years at interest rates of 6.3 to 6.8 percent. In its first year of operation from August 1, 2008 to July 31, 2009, the line generated ¥1.1 billion in revenues on 18.7 million rides delivered and incurred a loss of ¥0.7 billion. In the second year, ridership rose to 22.3 million and revenues improved to ¥1.4 billion, which narrowed to below ¥0.5 billion. To break even, the line must deliver 30 million rides annually. To be able to repay principal, ridership would need to exceed 40 million. As of 2012, Beijing–Tianjin Intercity Railway officially reported to break even financially, Defined as operational costs with debt payments is matched with revenue. ^ a b c "Turnkey construction of a high-speed line between Beijing and Tianjin for the 2008 Olympic Games". Siemens AG. Retrieved July 2, 2008. ^ "Delivery of the 1,000th Interlocking Container". Siemens AG. May 11, 2007. Retrieved July 2, 2008. ^ "Beijing-Tianjin high-speed train has caused 30% decrease in intercity bus transport".